Hello Stampers! Today I made a card using The Cutting Cafe's Under the Sea printable stamps for this week's Tuesday Throwdown challenge. The theme is "Anything Goes." I rarely make birthday cards for children so this was the perfect opportunity to make one. I created the background with various sizes for the crab and left it black and white. I then cut out a circle and embossed it. I then sponged Aegean ink all over to give the crab a nice contrast. The crab was colored in using Copic markers and fussy cut. I popped him up using foam tape. I added the sentiment by cutting it into a tag and using a red Copic marker went around the edges. Please head on over to check out the TT blog for more DT inspirations and enter to win a fun prize package from our sponsor. Thanks for sharing your gorgeous card with us at 613 Avenue Create this time. I love how you have used this spotlight technique with the cute crab image. This couldn't be cuter! Hard to believe you did this with one image stamp and a sentiment. It's so darling! 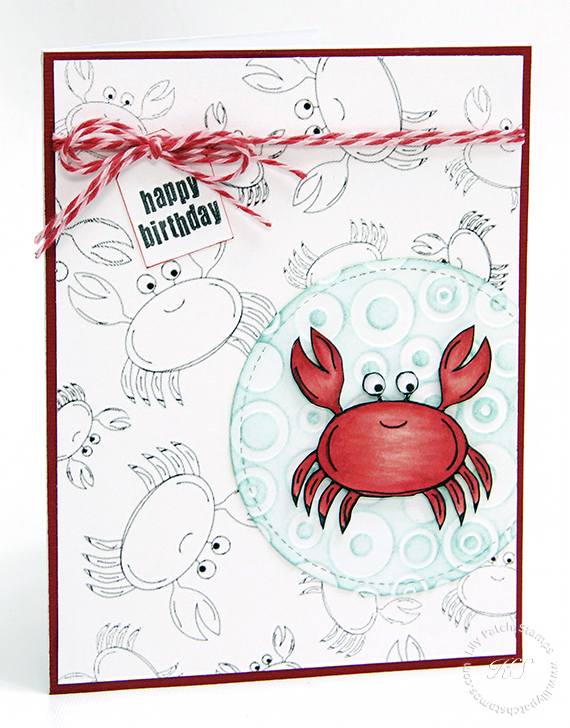 Love the embossed circle to help set off the colored crab. What a fun birthday card! What an adorable crab card! Very cute design! Great card - love how you've highlighted one of the images. The way you repeated the crab design in the background looks fantastic and the colored crab really pops. Fun birthday card! Very nicely crafted! Lobe the theme and your wonderful execution! Thanks for sharing at 613 Avenue Create! Love your card. Thanks for joining The Paper Nest Dolls.